I believe the best way to enjoy Idle Women of the Wartime Waterways will be once the good weather has kicked in and audiences watch and discuss the origins of the expression “Idle women” with its performers for long after the shows, preferably in a garden at the back of a pub overlooking a canal! Idle Women of the Wartime Waterways is a storytelling event presented by writers and performers Kate Saffin and Heather Wastie. Their two-part show presents different stories of women working on narrow boats on the canals between Limehouse and Birmingham during World War II. 75 years ago, the Women’s Training Scheme started: young women, from mostly middle class backgrounds learned to handle 72′ narrowboats with 50 tons of cargo. Just another example of women stepping up to the mark and taking on jobs no one thought they could do (although generations of women from the working boat families had been doing just that for years). Before taking off on a tour stopping in Nuneaton, Warwick and Cosgrove, there are a few more stops in London. This week, at the Cruising Association of Limehouse, I had the pleasure of exploring history with these ladies. The first half is a monologue performed by Kate Saffin. She plays the daughter of one of the “Idle Women”, is going through her mother’s old things and comes across a diary! We learn that her mother volunteered to train, started to learn immediately and came across others’ doubts as to why or whether she should work on the boats. She also fell in love through this work, by meeting the father of her future daughter. 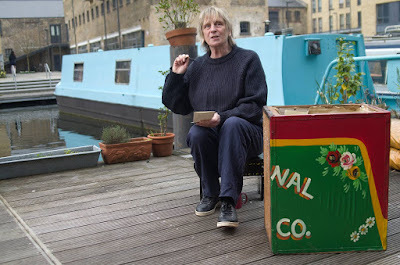 Thanks to a large painted box representing a narrowboat filled with props for the actress, the scene is set clearly. Saffin, who has a quiet voice, attracts our attention through humour and wonder. The piece is also well-written, regularly circling back to past anecdotes. There are few better ways to learn about history than through individual stories, and Saffin used existing accounts of the young women to create her monologue. The second half of the evening is a mix of poems and songs performed by Heather Wastie and based on the Idle Women’s stories. I enjoyed this part very much thanks to the rhythm of the poems and the participation of the audience during one of the songs. Wastie took time between each piece to explain the stories behind them, and it was great to hear her adapt actual original spoken or written text from the women. In both cases, the positivity of the women stood out for me. Yes, there was talk of war, dirt, heat or cold, but also of hard work, getting on with it and solidarity. out the locations and conditions even more: for example, as Saffin first entered in the first part, her parents’ attic could have been dark, lit only with a candle or small light. Wastie could have introduced her songs in advance before performing a few in a row, leaving us in the musical mood for longer, instead of breaking the songs up. This being said, as a storytelling night, it was good that there was not too much artifice. In today’s theatre world, effects, artifice and a certain perfection are often becoming the norm, whereas the simplicity of speaking directly and traditionally to the audience is unpretentious and doesn’t try to be something it’s not. This is a lovely evening of storytelling, learning and singing for the whole family.